Growing up an engine obsessed kid, if you would of told me back then there would be an all electric race circuit I would of laughed and said "Yea right". Well it's here and actually already in it's second year. Partnering with the AUDI Family on this was not only the best experience I could of gotten but it's always great being with a team that has specialized in innovation on the track since day 1 (plus they won 1st of course lol). First off the best thing you can do when you first come to Formula E (and trust me you want to) is throw all your previous knowledge and understanding out the window because this is completely different. I made that mistake coming in thinking this was just a variation of F1 but I was educated very quickly on how many differences there really are. 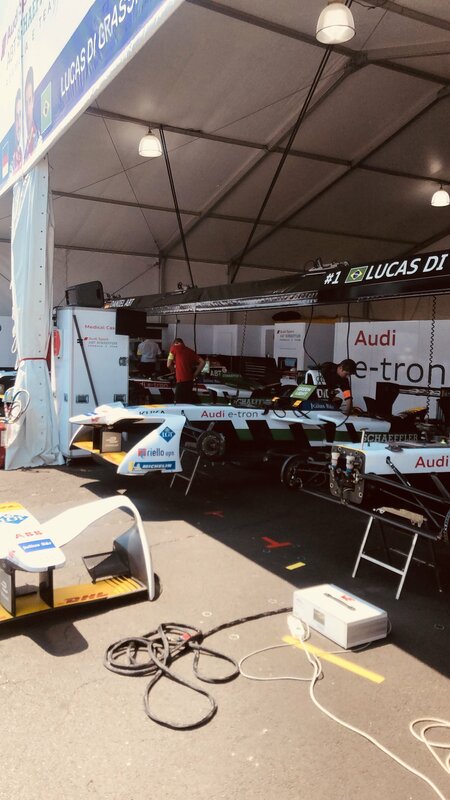 I talked with Lucas Di Grassi who races for Audi about some of the unique things and obstacles with these cars face. He mentioned that they are very difficult to drive and the main focus point of what he was saying is that battery conservation is one of the main keys to finishing first so it is not only who is the fastest but also who can conserve the most energy. He also went on to tell me about how the cars have no power steering which can get sketchy in the turns. Another interesting aspect of Formula E is there is very little noise compared to an F1 race. They sound like Killer Bees coming by is probably the best way I can describe it haha. With there being very little sound it has opened the door to many new locations that races can be held because of the noise which was what made this race cool. Seeing a racetrack setup in Brooklyn, NY was simply amazing. The turns were extremely narrow and tight along with a very short track so there wasn't much lag in the excitement. To wrap this up be sure to check the schedule and catch Formula E as soon as you can you will not regret it.